The New York Daily News is back at it again, creating yet another signature cover to create controversy. The most recent cover deals with the Yankees' current situation with free agents Bryce Harper and Manny Machado, both of whom remain unsigned just a few days prior to Spring Training. 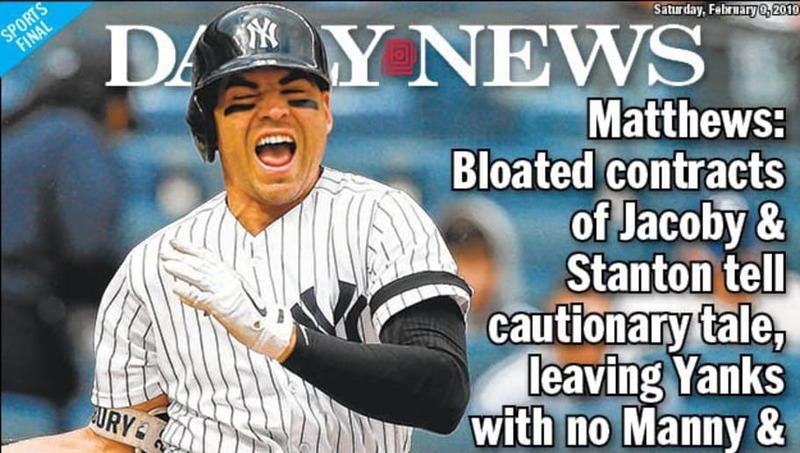 The Daily News has now labeled both Jacoby Ellsbury and Giancarlo Stanton as the reasons why the Yankees have no room to sign Harper or Machado, completely ignoring all context. While this cover is accomplishing everything that the Daily News wants to do, creating controversy and stirring up interest in the paper itself, it's still misguided. Stanton's contract, while large, is not necessarily a bad one given his production. The slugger hit 38 home runs last year and adjusted well to playing in New York as the year went on, carrying the offense well despite injuries to Aaron Judge and Gary Sánchez. Furthermore, in regards to Ellsbury, while his oversized contract was a mistake from the organization, it cannot be continually used as the reason the Yankees are in their current situation. It was a past error, but the Yankees could still sign one of the free agents if the team wanted to; the lack of free agent signings from the team cannot merely be blamed on Ellsbury. There's no salary cap. There's money to be spent. With time running out before pitchers and catchers begin to report, there is still a chance that Machado or Harper signs with the Yankees, further invalidating the paper's cover. However, regardless of where the two end up, this take is still irrational. Ellsbury and Stanton are not the reason the team hasn't signed either; if the Yankees truly wanted either player, they'd be in pinstripes by now.